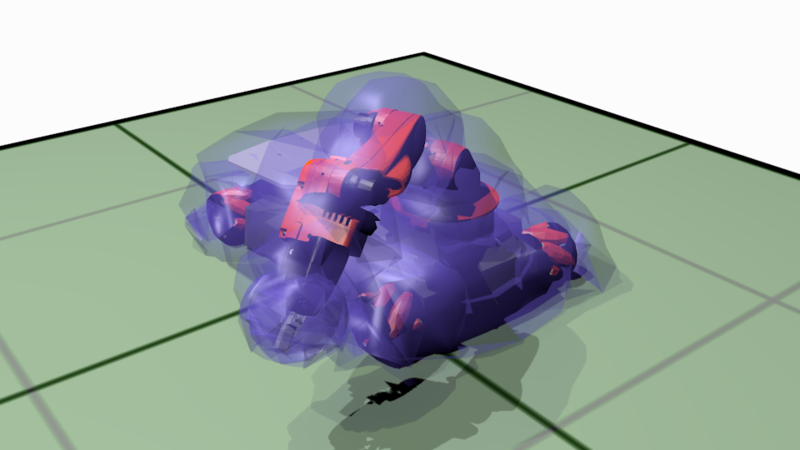 Example of a robot model and enlarged collision model created by ray-tracing. The RobotEditor is a tool developed at the High performance Humanoid Technologies (H²T) Lab. It relies on established and expandable open-source software rather than designing such a complex project from scratch. The 3D modeling software Blender has been chosen for the reason of being open-source, very versatile and expandable through a scripting interface on top of being supported by a very large and active community. The RobotEditor exploits this scripting interface to transform the software into a full-fledged modeling tool for real-life robots allowing the design of kinematics and dynamics following the conventions used in robotics. Every parameter can be specified by the developer in designated interfaces. In addition, the Robot Editor implements a novel and industry approved file format, COLLADA in version 1.5, with a strong focus on kinematics and dynamics which is not natively supported by Blender and that is had been integrated into the Simox robot simulation environment. Furthermore, it is largely backed by leading companies of the automotive and entertainment industries. Altogether, this makes the RobotEditor a a very useful tool completing a tool chain of robot simulation offered by Simox. This drastically reduces the effort for experimenting with virtual robots and robot hands in simulation. Despite having been designed for modeling robot hands, it is not limited to that only and allows the creation of models of complete and complex models of humanoid robots and even of parametric models of humans for motion capture. On top of this, Blender enables the creation of photo-realistic illustrations by ray tracing. The RobotEditor is OpenSource and hosted on GitLab where you can also find installation instructions. No additional software apart from Blender is required.